The Hashbury Safehouse is a safehouse located in the southeastern corner of Hashbury, San Fierro in Grand Theft Auto: San Andreas. The safehouse is located a few stories up from the ground floor, as viewed from the exterior. After going up a small set of stairs, the player is in the living room of the house, complete with two big sofas, a coffee table and a television. Connected to the living room is the kitchen, where the player can access the save point, and a hallway which contains a bathroom, several bedrooms and the wardrobe. Carl Johnson, the player character, can purchase the safehouse for $40,000. The safehouse has a garage that can store four vehicles. The exterior of the safehouse is similar to the Portland hideout in Grand Theft Auto III. In the safehouse there is a picture of an Idaho from GTA III. 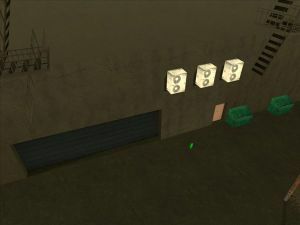 Due to a glitch, the save icon for this safehouse is visible at one point in the Jefferson Motel, which is way over in Los Santos, although the icon is generally inaccessible from that location. This page was last modified on 20 January 2013, at 20:46.